Let's Talk: Timing Couldn't Have Been Better - Coincidence? Timing Couldn't Have Been Better - Coincidence? A project started years ago. I am talking serious years. As in: at least ten. It was the dawn of my writing. A fun gift for my students. The sprouting of a precocious character who acted a lot like (confession time) I did. Yeah. I was the kid my parents wanted to return. The good news is...kids like me can turn out to be sweet, loving, kind, compassionate, considerate, really wonderful people. We rascals walk through the school of hard knocks. Gladly don our bumps and bruises, punishments, time-outs, and shunnings. Then like a caterpillar exits a cocoon as a quasi wonderful human being, we become the people our parents prayed for. What better story to write. William is a boy full of mischief. If there isn't any trouble to participate in, he makes it. Until one day when the result of mischief happens to him. "That's not fair!" How could this happen to him? 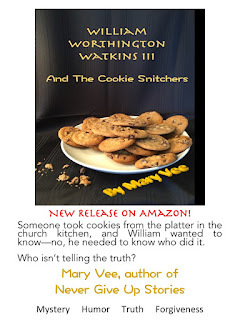 William Worthington Watkins III has been a story waiting for my writing skills. After hordes of studying, practicing, polishing, editing, polishing again William is ready to tell his story to you. Finally! His tale is available on Amazon for only $5.99. William tells his side of the story. A mystery with humor. Of truth and forgiveness. The perfect gift for an end of a school year or summer read. A friend of my daughter stopped by. She picked up the book and sat right at my kitchen table reading through the book. She tuned out everything around her, turning pages and laughing. At the end she closed the book and smiled. "This is a cute book!"